Presenting the award Prime Minister Manmohan Singh said the State was obliged to play a facilitating role in developing and promoting the creative talents and diverse cultural expressions of the country. “Appreciating Indian culture should involve the understanding, acknowledgement and recognition of all the different strands and hues of our composite cultural fabric,” the Prime Minister said. Dr Singh said while educated Indians were quite familiar with the works of famous writers of the West, they were much less exposed to the works of outstanding litterateurs in Indian languages. “Though in recent years, Indian writers in English had earned a name for themselves both in the country and abroad, the flowering of literary talent in other Indian languages needs a larger platform and greater recognition,” he said. The Prime Minister stressed the need to promote cross-translations of works in various Indian languages. “The beautiful poems of ONV Kurup should be available in Bengali or Marathi. Promotion of such cross-translations is an important task that has been taken up by the Sahitya Akademi,” he said. He said the Akademi had been asked to step up their efforts to propagate the richness of contemporary and classical Indian literature. Recalling the words of British poet Shelly who said that “poets are the unacknowledged legislators of the world,” the Prime Minister lauded ONV Kurup’s poetry which reflected social commitment and romantic idealism. “Kurup’s poetry has humanistic appeal and reflects his strong belief in human dignity and freedom. The richness of his works derives from the beauty and charm of his works and lyrics and his close observation of nature and human relationships,” he said. 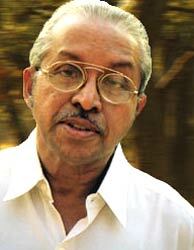 He also commended Kurup’s contribution to Kerala’s entertainment industry as a song writer of repute. The Prime Minister said over the last five decades, the Jnanpith award had established itself as a very prestigious honour recongnizig the best of literary talent in the different languages of India. While Kerala’s own poet G Sankara Kurup won the first Jnanpith award in 1965, other eminent writers like Tara Shankar Bandopadhyaya, Uma Shankar Joshi, K V Puttappa, Sumitranandan Pant and Firaq Gorakhpuri were among the other recipients, Dr Singh said. The State’s efforts to promote creative talents needed to be supported by private patronage of arts, he said, and praised the initiatives like the establishment of the Jnanpith award that recognised, nurtured and promoted excellence in Indian writing. Sitakant Mahapatra, chairman of the Jnanpith selection board, who was also present, said the focal point of ONV Kurup’s works was the juxtaposition of joy and sorrow. His poems presented a progressive ideology with lyricism and beauty. “His poems are uncomplicated, sincere, linear and had aesthetic elegance,” Mahapatra said. In his acceptance speech, Kurup said any poet who wrote in a language should be regarded as an Indian poet. “My mind flies away to wherever there are human beings,” he said about his poetry. “When I vacate this rented abode called earth, I leave a vital element of my living presence here. That is my poetry,” Kurup said. Governor R S Gavai, Chief Minister V S Achuthanandan, Defence Minister A K Antony, Union Minister for Civil Aviation Vayalar Ravi, Shashi Tharoor MP were present on the dais. Sahu Akhilesh Jain, Managing Trustee, Bharatiya Jnanpith and Indu Jain, Jnanpith President, were also present. The previous Jnanpith award winner M T Vasudevan Nair, this year’s Moorthi Devi Puraskaram winner and poet Akkitham Achuthan Namboodiri, film-maker Adoor Gopalakrishnan and poet Sugathakumari were among the audience.